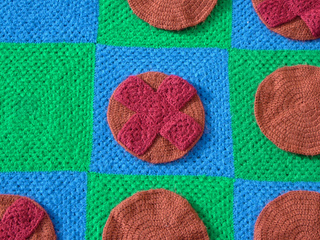 In UK we call this game Noughts and Crosses but it is known all over the world. 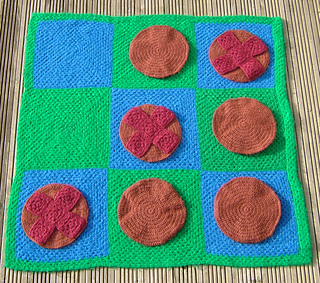 This large-sized version is great fun as it can be used as an afghan or as a floor game. 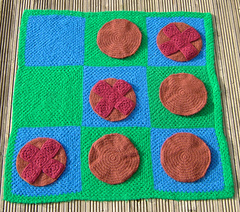 The pieces are large so you could make a bag to store them and use it as a cushion. Whenever we have taken this game to Maths and Science Fairs, it has been amazingly popular with the most unlikely-looking teenagers. The reaction is always the same: first they use the playing pieces as frisbees then quickly settle down to organise games and tournaments. Younger children (and adults) also love it.